Modern Mediterranean restaurant Artemis Grill will be hosting a wine tasting on Wednesday 6 December 2017 at 6.30pm to 8.30pm featuring the wines of Passel Estate. Based in the Margaret River wine region in Western Australia, family-owned boutique winery Passel Estate produces wines crafted by renowned winemaker Bruce Dukes that are highly indicative of Margaret River’s Wallcliffe sub-region. 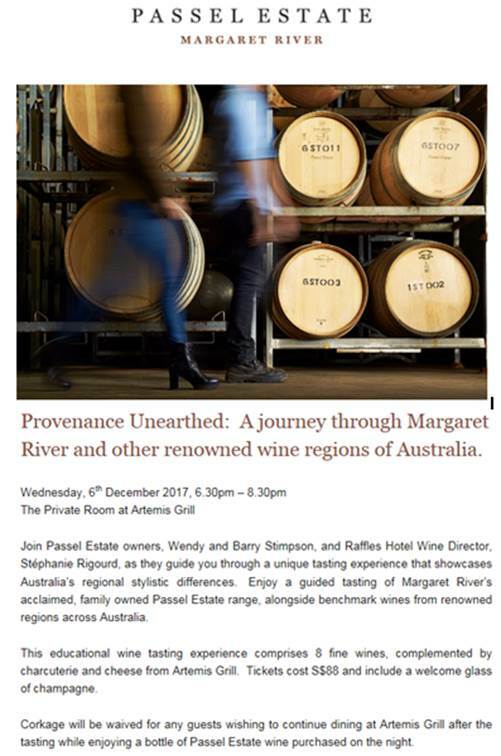 Owners Wendy and Barry Stimpson will be joined by Raffles Hotel Singapore wine director Stephanie Rigourd to present this educational wine experience that will showcase Australia’s regional stylistic differences. This wine tasting includes a welcome Champagne and eight wines that will be complemented by cheese and charcuterie. Tickets are $88++ per person; to book a spot, call +65 6635 8677 or email enquiries@artemisgrill.com.sg.